What a terrific group of students we have in this program right now. Not only talented in the arena but extremely dedicated to their studies, they are also willing to help improve this program in any way they can. I have several students stepping up and taking on more responsibility this year as pride continues to grow within them. We had a great season last year and started this year with strong enthusiasm. As a coach it is sure nice to have such a dedicated group willing to put in the time and the effort to be at the top of their game. I couldn’t be prouder of these student athletes. Especially when they bust their butts to pack a full university workload, have their final exams the week before the College National Finals Rodeo (CNFR), and manage as well as they did. This year we took nine students to the college finals and they represented the program extremely well. 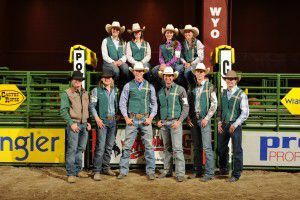 The Cal Poly Rodeo Team that represented the Mustangs at the 2014 College National Finals Rodeo in June. Top: Alexa Karkula, Kayla Nichol, Emily Cary and Brooke Hirschy. Bottom: Coach Ben Londo, Kelly O’Day, Taylor Santos-Karney, Lane Santos-Karney, Colton Farquer and Chase Bowen. Dan Hubbell Photo. 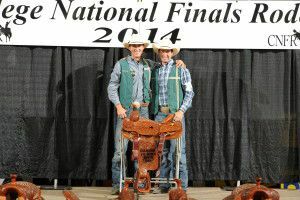 Congratulations to Taylor Santos-Karney for bringing home the national tie-down roping title! 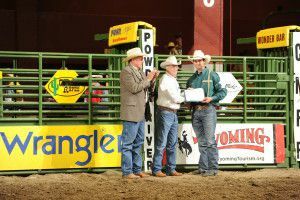 Taylor put on a dominating performance at the CNFR and damn sure let ’em know that the Green and Gold was there to win. 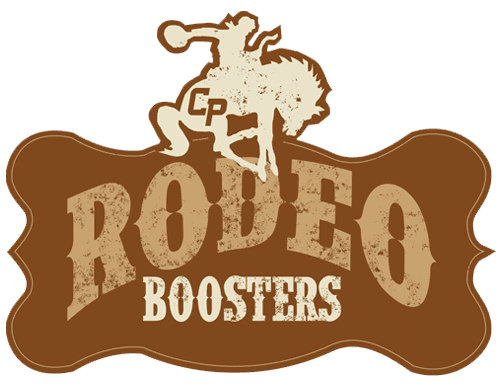 We were well represented in the tie-down roping across the board, with all three of our team members – Taylor, brother Lane and Colton Farquer – placing in the top 25 of the nation. Our breakaway ropers had some tough luck. However, I commend Brooke Hirschy and Alexa Karkula for leaving it all on the line. Both girls had roped phenomenally all year and could have easily been in the short round and walked away with a world title had the cards lined up differently… but that’s rodeo as we all know. Brooke ended up 15th overall after splitting 8th in the first round and splitting 5th in the second round. Freshman Kelly O’Day came to Casper with a veteran like poise and ended up ranked as the 24th steer wrestler in the nation. 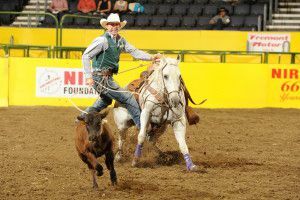 Kelly had two great first rounds and was knocked out of the average on his third round steer. I’m looking forward to Kelly’s continuous improvement and work ethic carrying him a long ways in college rodeo and beyond. Emily Cary, Kayla Nichol, and Brooke Hirschy led the charge in the barrel racing and we walked away with Senior Emily Cary ending up 17th in the world. The barrel racing is one of the tougher events at the CNFR and I’m proud of our girls for representing us as they did. Chase Bowen was our only roughstock hand to represent Cal Poly at the CNFR and he did so in style. Chase won the third round with an 81.5 point ride. 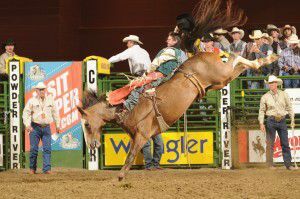 Chase came down off of a bucker in the short round but was making a great ride. His riding style and ability will keep him in the hunt for a national title in years to come. As I mentioned, I am extremely proud of our young Mustang team. They all have an amazing level of talent and I cannot wait to see them evolve into the young men and women they will become over the next few years. Boosters, alumni, friends; be proud of this team and the students in this program. They are carrying on the legacy well.